You could say that I spent the weekend feeling much like the lyrical subject of this poem. From the window by my desk, I’ve watched the sunshine force the fog out and the people cross the intersection with ice cream cones in their hands. I was but a spectator, trapped indoors by a strange viral infection on a few of the loveliest days of the year. But, honestly, despite the slight twinge of jealousy I felt about the things I was missing out on (largely, this was all about the ice cream comes marching by! ), this weekend has been well spent and incredibly restorative. Given the busy year that I’ve had thus far, I think my body was finally telling me it was time for a rest–for both a little reading on the couch with the windows wide open and for watching the Greek movies in my Netflix queue. One of them was beyond creepy (Dogtooth, or Κυνόδοντας) and not for the fainthearted, so I had to watch another one about a happy-go-lucky prostitute who sings and dances, Never on Sunday (Ποτέ την Κυριακή), to wash the taste from my mouth. 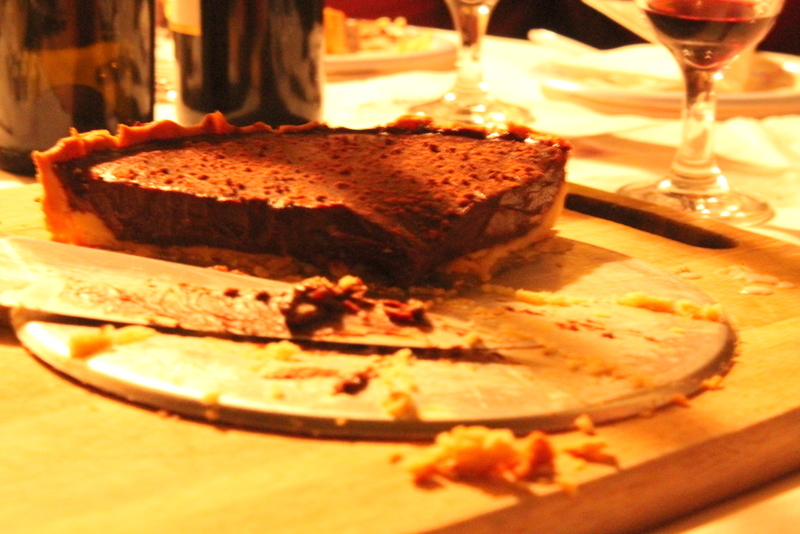 And, if that wasn’t enough, I had some photos from a lovely Serbian BBQ that the Greek and I were invited to on Wednesday evening–naturally, I had offered to make dessert–not to mention some leftover chocolate filling that didn’t make it into the tart shell…. I was a somewhat at a loss as to what to make. When we had talked to the host at the Serbian banquet on Orthodox Easter, I had mentioned pie, but then I was faced with the eternal question that bakers and cooks often encounter: do you make something that was successful again–and so soon after–or do you try your hand at something new? This is a often a dilemma in my kitchen. While I long ago established that I could eat cheese pie (sweet or Greek-style savory) or pumpkin cake or stout cake everyday, I know that that would be boring in the long run. A girl does have her limits! Plus, as attached as I get to things, there’s a time for staple recipes and a time for experimentation. This just happened to be a time for the latter. I had a genuinely difficult time deciding what to make; I had promised pie, but was feeling uninspired by the pie recipes I had access to. Then I thought about pie’s pretty fabulous cousin, the tart, and decided a tart it would be. But nobody could offer me the best of both worlds. 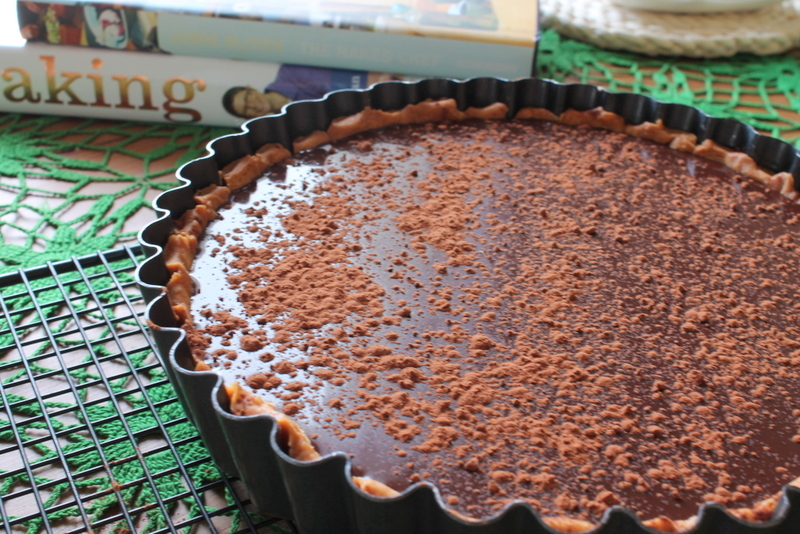 So I decided to create that world myself with Dorie Greenspan’s “no-roll” sweet tart dough (pâte sablée) and Jamie Oliver’s simple chocolate tart filling. In that one simple tart, let me assure you that heavenly proportions were achieved: crispy tart dough and a smooth chocolate filling that should should be so soft that it cuts, in Jamie’s words, “like butter.” And, because Dorie’s tart shell makes a 9-inch crust and Jamie’s filling makes enough for a 12-inch tart, you get a little extra chocolate out of this already more than sweet deal. Put it aside for ice cream, or spread it on toast like you would Nutella and a banana. It’s often dangerous, or at least they say it is, to bake something new for a party. 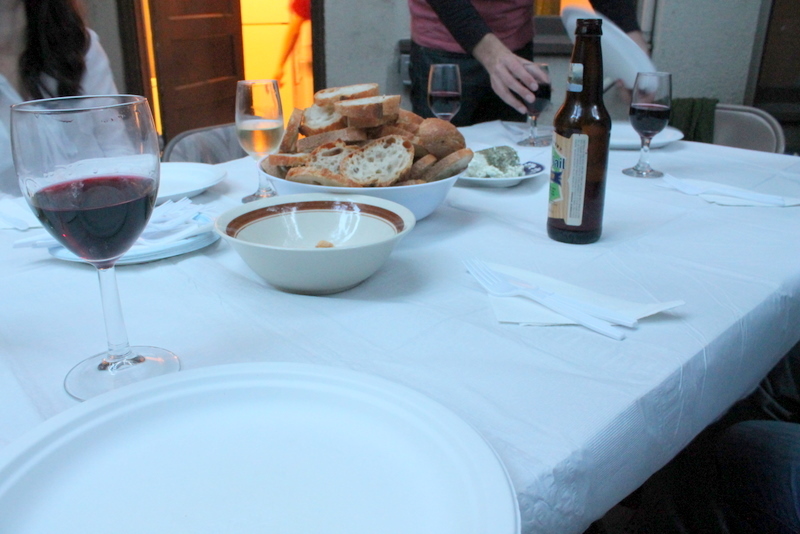 While I did feel the occasional twinge of worry throughout the meal that it wouldn’t be good, there was plenty of food to keep my attention on the matters at hand: salad, cheese, bread, wine (lots of wine! 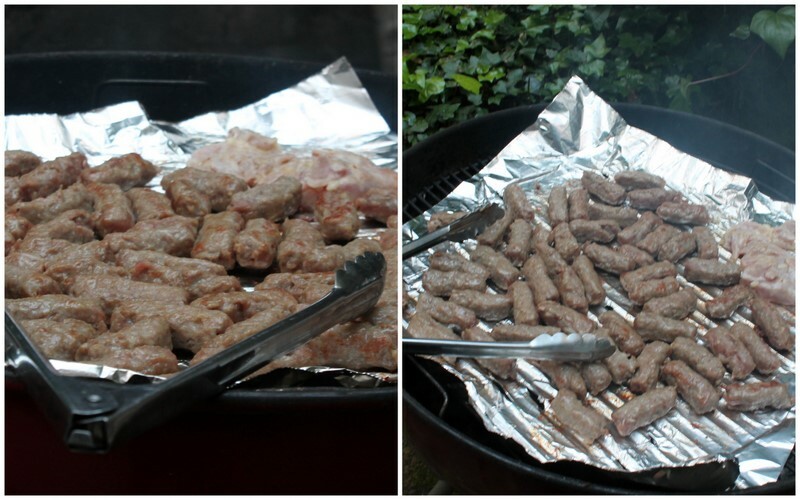 ), grilled chicken and, one of the stars of the evening, chevapchici–minced meat shaped into little spicy sausages. This was the second time I had dinner in this lovely north-side garden in the past three weeks and each time I’ve been impressed by both the food and the accompanying hospitality. Considering we ate and talked and drank well into the night (one of the guests was celebrating a birthday), I guess you could say that I had my weekend early. -Put the flour, powdered sugar and salt in a food processor and pulse a few time to combine. -Scatter the butter over the dry ingredients and pulse until the butter is coarsely cut in (it should resemble a mixture of flaky oats and peas). -Add the yolk a little at a time, pulsing after each addition. -Once the egg is completely added, pulse 2 to 3 times for about 10 seconds each; the dough should look clumpy at this stage. 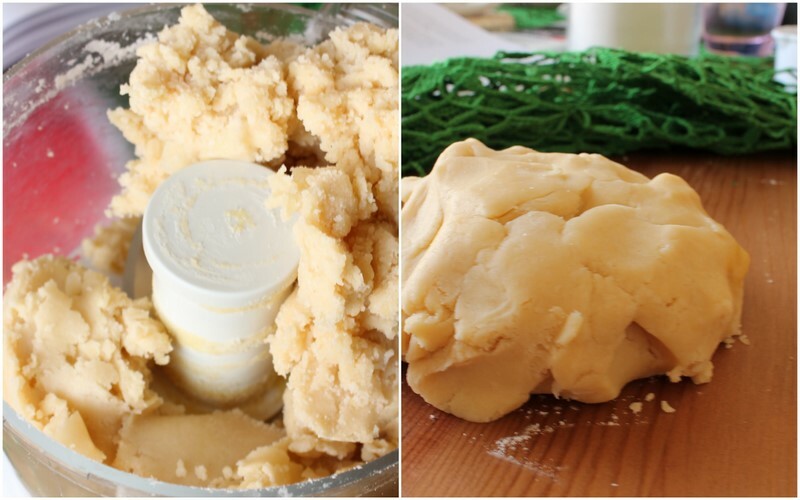 -Turn the dough out onto a work surface and knead very lightly until the loose bits of flour and dough are incorporated into the larger dough mixture. -Butter a 9-inch fluted tart pan with a removable bottom. -Press the dough evenly over the bottom and sides, being careful not to overwork the crust; you don’t want it to lose its crumbly texture. Also, you should save one tiny bit of dough for patching any cracks that might emerge while baking. -Freeze the the crust for about 30 minutes before baking. -Butter the shiny side of a piece of aluminum foil and fit the foil, buttered side down, tightly against the crust. Fill the pan with weights or put a pie plate or cake pan on top of the foil to weigh down the dough and prevent it from shrinking. 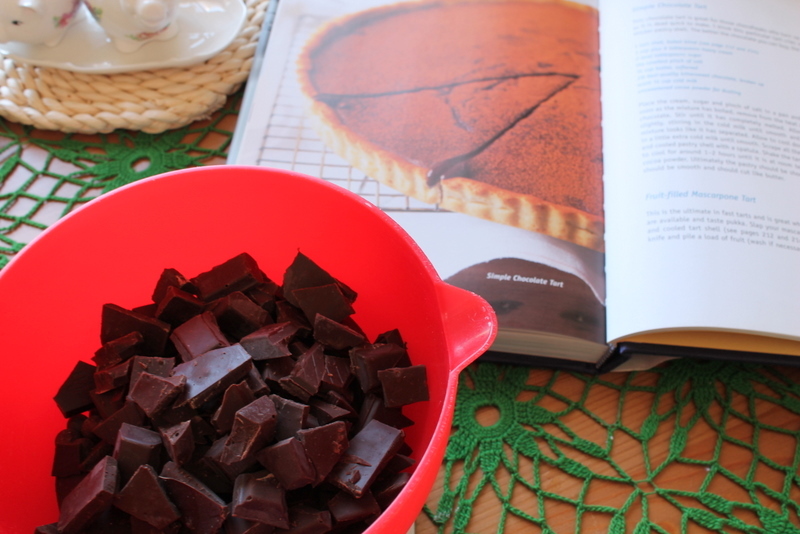 -Put the tart crust in the oven and bake for 25 minutes; then remove the foil (N.B. If you decide to use this tart shell and make another kind of filling, you may need to partially bake the crust. If this is the case, you would want to remove it now). -Bake the crust for another 8-10 minutes, or until it is firm and golden brown. -Remove from the oven and patch immediately, if necessary. You can simply patch it and leave it as is, or you can put it back in the oven for another 2 minutes (I did the latter). -Let the tart shell cool before filling. -Place the cream, sugar and pinch of salt in a saucepan and bring to a boil. -Once it’s reached a boil, remove from the heat and add the butter and chocolate. -Stir until it has completely melted. -Allow the mixture to cool slightly, stirring in the cold milk until smooth and shiny (it may separate a bit at this point, but just keep stirring until it’s incorporated). 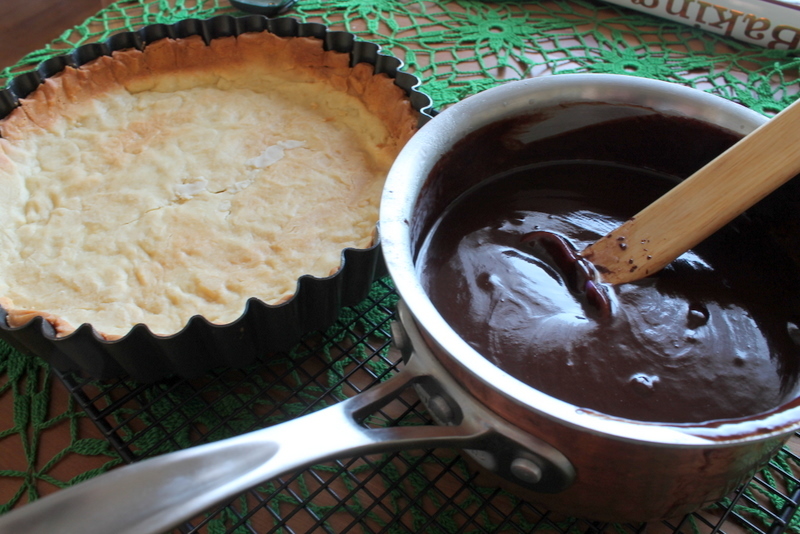 -Scrape, using a spatula, the mixture into the baked and cooled tart shell. If you, like me, end up having extra chocolate, save it and find some other use for it; it’s always nice to have leftovers. 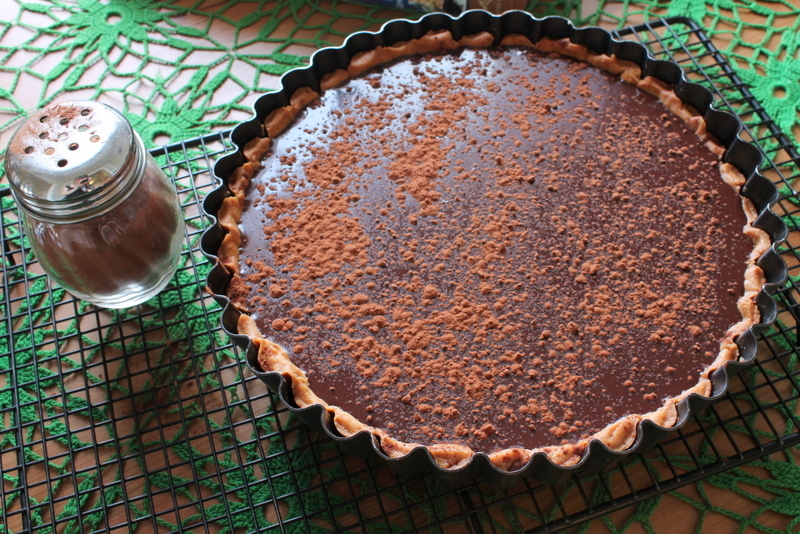 -Shake the tart a little to even it out and dust the tart with unsweetened cocoa powder. -At this stage, even though the original recipe said that you can leave the tart at room temperature for an hour or two for it to firm up, I opted to put the tart in the refrigerator for about 45 minutes. It was quite warm here and, also, to make the tart transport friendly, I felt that was the best way to get things moving in the right direction. -Remove from the tart pan and cut into its buttery smoothness.